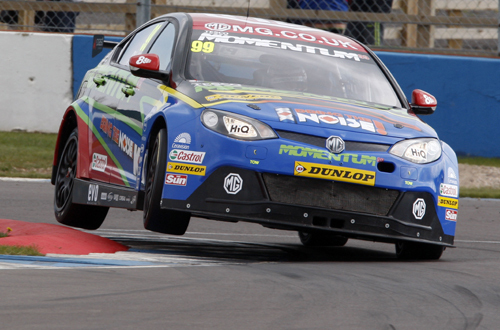 Points leader Jason Plato will line up in pole position on the grid for the first of tomorrow’s three Dunlop MSA British Touring Car Championship races at Donington Park. Plato’s new MG KX Momentum Racing MG6 set the fastest lap early in this afternoon’s qualifying session before rain thwarted his rivals’ chances on the swooping Leicestershire track. It was the 36th pole of Plato’s illustrious career – achieved, significantly, in a car carrying maximum success ballast – and the former double Champion from Oxford was ecstatic. Fife’s Gordon Shedden will start alongside Plato from second on tomorrow's grid – his best lap in his Honda Yuasa Racing Team Honda Civic was just 0.054s adrift of Plato’s pole time. His Honda team-mate Matt Neal, the reigning Champion from Worcestershire, was third. Another Honda driver, independent Andrew Jordan – one of the local favourites from Lichfield – was fourth in his Pirtek Racing Civic. He was one of the few drivers to improve his position as the track started to dry slightly in the session’s closing stages – another was Robert Collard who moved up to fifth in his eBay Motors BMW at the expense of Warwickshire ace Mat Jackson’s Redstone Racing Ford Focus ST.
Tomorrow’s three races will be shown live during a mammoth seven-hour broadcast from 11.00am-6.00pm on ITV4 and ITV4 HD as well as the www.itv.com website.